Plant breeder (and 2016 Mehlquist Award recipient) Professor Mark Brand is working with Assistant Professor Dennis D’Amico to develop a nutritious brand of UConn-made yogurt. Most of us are familiar with the delicious ice cream made from UConn cows’ milk. We may soon find ourselves waiting in line for a serving of UConn yogurt flavored with healthful Aronia berries, aka black chokeberry. For Brand, Aronia is a “viable new novel berry crop” that could become mainstream in a similar way to cranberries. However, he thinks that product development for Aronia fruits is needed because the berries can’t be eaten fresh. He also said, “It is a wide-open playing field to modifying the crop because nobody has done anything on Aronia. It should be possible to take some initial steps forward.” If Aronia as a crop is successful, Brand sees the need to enhance its large-scale commercial production potential. To that end, he wants to make it easier to mechanically harvest the Aronia berries by getting the heavy branches of the shrub off the ground. Brand is currently experimenting with grafting the native black chokeberry onto European mountain ash rootstock, which is related to Aronia. D’Amico said, “This yogurt showcases the milk, and it can shine.” The yogurt has a longer shelf life because of the quality and freshness of the locally produced milk used. D’Amico was so proud of the yogurt, he personally took a sample to UConn President Susan Herbst. 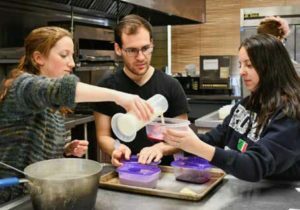 In addition, UConn Dining Services made it into parfaits and said that it was well-received.